Some approximate values for commercial installation of solar panels in India. 1 KW panel takes approximately 10 sq metres area. 1 KW generates approximately 4 units of power daily. It takes about 4 panels per KW power. The life of the system is about 25 years. 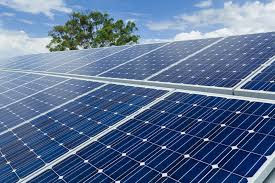 Solar panels in India comes at a cost of approximately Rupees 50 lakhs for 100 KW. A 100 KW solar system thus generates about 400 units per day, ie. 12,000 units per month or 144,000 units a year. At about Rs 8.60 per units, this translates to benefits of Rs. 12 lakhs a year. A 1 MW plant would thus result in capex costs of Rs 5 crores and energy savings of approximately, 1.2 crores every year. Ie in approximtely 4 years, the turn around time, the total capex costs would be paid off. Isin't this attractive enough for entrepreneurs, especially the energy ones to open up retail energy stores across the country, selling power to end users either through the distribution grid or through the company;s own delivery and distribution network ?